I just came back from a two week mountaineering course in the North Cascades with the National Outdoor Leadership School (NOLS). Mountaineering has the reputation of being a rather manly activity, so I would not have been surprised if I was one of only a few women on my course. However, I was the only woman. Ten guys and me. I wasn’t really that worried about spending two weeks in close quarters with a bunch of guys I just met. But gender played out in interesting ways I wasn’t expecting. One was that size. I am a small woman. Most of the guys in my group could carry 15-25 pounds more than me before hitting the recommended pack weight limit (40% of your body weight). All of us packing at NOLs, my personal gear in the foreground. I tried my best to take on as much group gear as I could. However, I hit my max really quickly. For the first few days, I wasn’t able to lift my pack without assistance and was moving pretty slowly. It was super frustrating for me. Definitely a lesson for me in working within my limitations. We approached Mt Baker from Boulder Creek, spending the first day hiking through the forest in pouring rain. At a trail junction on Boulder Creek trail. That evening, I was rewarded with my first view of a glacier. I didn’t leave my tent because it was just too wet and I was too tired. We struggled all day in terrain that was new to us, including using our crampons for the first time to climb around a tall, dirt covered piece of ice. At the end of the day, we could still see our last campsite. And then we learned we had gone the wrong way. I wasn’t frustrated though, just so excited to be moving closer to the giant ice and snow covered wall in front of me. Approaching the toe of the glacier. The next day, we moved much more quickly as we became familiar with the terrain and our equipment. We found a beautiful camping that we stayed at for two days while we started snow school. We learned how to kick steps snow, walk in a rope team, self arrest with an ice axe if we fell and build basic snow and ice anchors/protection. Learning how to walk as a rope team. What drew me to mountaineering was a love of being in nature. So snow school was fun, but I saw it mostly as a means to an end. I wanted new and closer perspectives of my most beloved mountain, Mt. Baker. Taking some time to admire Baker while getting water. We left for a higher camp on Baker after a few days with the goal to try for a summit. Unfortunately, on our summit attempt day we woke up at 4:30am to pouring rain that morphed into hail, high winds, a rare pacific northwest thunderstorm. We went back to bed to wait for the weather to clear and attempt a traverse around the east side of Baker to get closer to Mt. Shuksan, our next destination instead. The glaciers we were travelling on (Boulder, Park, Rainbow and Shoales) were heavily crevassed. I was on the first rope team and found it completely thrilling move around the giant maze of the mountain in an intermittent white out. We weren’t sure if we could find a way through, and ran the very real risk of hitting a dead end and needing to turn around after hours of hiking to find our way back in the dark. Navigating the crevasses on Boulder glacier during a break in the white out. 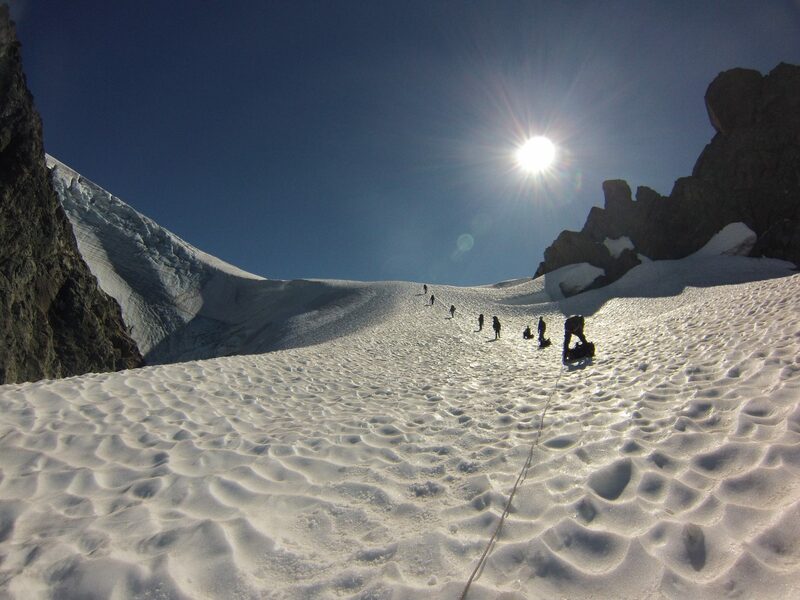 Our instructors said it was one of most difficult times navigating crevasses on a glacier they had ever day. I loved peering down into the deep crevasses and the challenge of walking along foot paths that connected our path. I thought I was going to love climbing peaks, but I instead fell totally in love with crevasses. Snow school continued the next day with crevasse rescue training. We had one member of a rope team jump into a crevasse (while on backup belay), simulating an accidental fall. One member of the rope team had to arrest his fall, while another built an anchor and pulley system to transfer the weight and haul him up. Rescuing someone who jumped into a crevasse during snow school. We also learned to rescue ourselves by rappelling into a crevasse and ascending out using a system of ropes to stand on and hold us. A photo from inside a crevasse I took while rappelling in. Me hanging out in a crevasse. Before long, it was time to move. Our trip was more than halfway over, and we need to meet up with NOLS for a re-ration. Checking the maps before we continue our hike to Mt. Shuksan. Loading up with new food and supplies dropped off by a friendly NOLS staff member. It felt pretty great to be away from the snow and ice and be back in familiar territory. I was hiking pretty quickly, feeling confident and excited to get to visit a new mountain. Hiking along trails again, approaching Mt. Shuksan. We camped at Lake Anne, which seemed to be a fairly popular spot with other hikers. Lake Anne looking like an infinity pool. The next morning, we headed up Fisher Chimney’s not really knowing what we had in store for us. The guidebook called it a “tortuous and stimulating” route. A quick, steep hike towards Fisher chimneys. We quickly ran out of trail. We consulted the guidebook’s prose and sketches for guidance, but finding a route through all the rocks was definitely time consuming. Several small groups went ahead to scout routes and eventually we found where we were going. Looking at the maps and sketches and matching them with the terrain around us. The Fisher Chimneys turned out to be incredibly steep. We used fixed lines to help us safely climb them with our fully loaded 80-100L packs. We were passed by a French Canadian couple and a group of people training to be mountain guides out for the weekend, who had the skills, experience and light enough packs not to use ropes and anchors. One of our instructors told me to eat spoonfuls of butter and sugar before going to bed for extra calories to help stay warm. I did not need to be told twice and followed his advice with great enthusiasm. Also, a new friend lent me his warmer, longer sleeping pad. This plus the butter diet made me learn to love camping on the snow. The next day we spent exploring our path up Winnie’s Slide and Hell’s Highway, both fairly steep but straightforward sections. There was a tricky part where we climbed into and out of a crevasse to continue on to the next section. I now love being in crevasses, so I thought it was fun but also terrifying as parts were extremely icy. Eventually we camped on the glacier just below the summit. The next day was a fairly easy hike across the glacier and scramble up some class 3 and 4 terrain. It would have been fairly straightforward, except for my plastic mountaineering boots! Those things made walking on anything except snow quite frustrating. Climbing up the summit pyramid of Mt. Shuksan. We made it to the top early in the day. We spent a few moments thinking about the people who helped get us to that spot. I thought about my parents who are always encouraging me in whatever I choose to do. I also thought about my boyfriend, who I share a love of climbing and cycling with, and is always telling me I am strong and can take on anything. Then we rappelled down, which was incredibly fun. There were only a few days left, where we slowly made our way back down the mountain. This trip was the end of a year off from working full-time where I starting pursuing my MA. It was definitely an excellent way to start a new chapter of my life. Pack less: As a very small person, I really need to focus on buying lightweight equipment and bringing less of it. This would help me shoulder more of the group burden. Take more risks: With all things in life, I am extremely cautious. I learned on this trip I could just give some things a go, without too much planning. I often was much more capable than I was giving myself credit for. Pain is ok: I found this trip very physically demanding, even though I thought I was fairly active. I spent most of the two weeks with very sore muscles and sometimes pain, but I was still was able to push myself harder and harder each day. I was also very inspired by one of the people on my trip with really severe foot pain, who kept pushing through the whole time. Men are pretty great: Leaving my mostly female and/or queer social bubble and relating to people so different from me for an extended period of time was definitely a huge challenge for me. That being said, everyone on the trip was so so great. It felt like a bit of a once in a lifetime experience to learn so much about men and masculinity. If you have any questions about being a newbie mountaineer, NOLS or the area, leave me a comment and I’ll do my best to answer them! Thanks for reading. Fascinating Jes. Thanks a lot for this. You are an amazing young woman Jessica! Thanks for sharing your wonderful adventure. You have always been a free spirit and I love your spirit of adventure.